Marble is a KDE application that shows a 3D representation of the world and has the ability to overlay different layers. 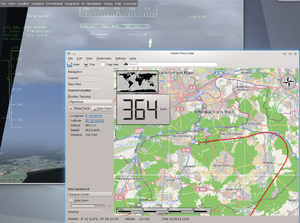 Since KDE 4.9 it is capable of getting the aircraft's position from FlightGear and showing it on the map. Start up Marble (version 1.4 at least) and enable under View the "Current Location" checkbox. Then select in the "Current Location" tab "Flightgear" as Position Tracking. Now you can start up a Flightgear session with the additional option "--nmea=socket,out,5,localhost,5500,udp" to make your aircraft show up in Marble. This page was last modified on 30 October 2013, at 08:27.